You can never have too many wine glasses, but not all wine glasses are the same. Whether you want some lovely wine glasses for a wedding celebration, a gift to friends on their anniversary or any other celebration you can think of, we have the answer that will turn a nice idea into a gift that will be treasured forever. Our wine glasses are the high-quality wine glasses that you would expect to give as gifts, beautifully made with clear glass and a lovely shape. However, what makes our unique wine glasses so different is the exceptional engraving that we offer to create truly personalized wine glasses for any occasion. Whether you are looking for a pair of wine glasses for an anniversary gift or enough for a celebration event, our engraving service allows you to customize wine glasses to create the perfect gift for the special people in your life. We use highly detailed engraving to include names, messages and so on, ensuring each glass is a unique and personalized gift that has extra meaning for all. 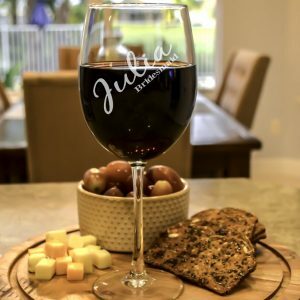 Whatever the celebration or the people involved, with our personalized wine glasses, you can be sure that you are creating the perfect gift that will add meaning and become a true memento of a special moment. Our customization service is second to none, we only use high-quality wine glasses that are the perfect fit for your needs, and you can be sure that our engraving looks as beautiful as you image, every time. We recognize just how important these special, gifts are to you and those you are giving them to, and we treat every order with the care and urgency that you deserve. Fast, safe delivery is an important part of the package, and here we lead the way again. Having delivered thousands of wine glasses to every state, we know how to make sure your unique wine glasses arrive safe and secure and ready for that special day. 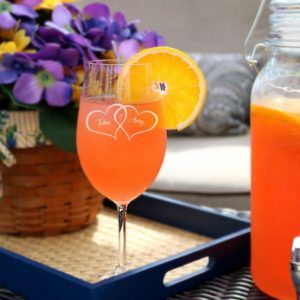 With a choice of designs available from everything from a birthday win glass gift to anniversary messages, and a choice of standard wine glass, personalized red wine glasses and unique stemless wine glass, there is something for every taste and every occasion. 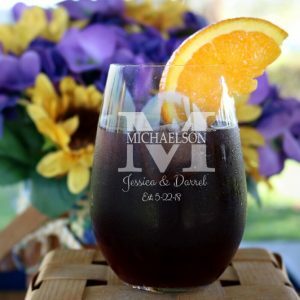 Add in our incredible customer service and attention to detail, and you can be sure these are the best personalized wine glasses available for your next celebration event. Ordering is easy, simply choose the style of glass you want, the message or names you prefer and how many you need and let us take care of the rest. We will ensure they arrive on time, safely and securely, with perfect engraving, all ready for your special day. Don’t leave your personalized win glass gift to chance, let us create the perfect wine glass gift for you and you can rely on us to deliver every time. These are the best gifts for any wine lover.